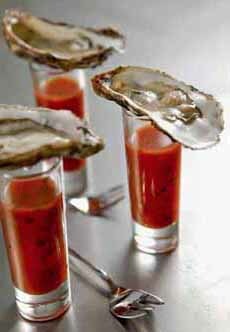  Stylish Bloody Mary oyster shooters (photo Pinterest | Chowhound ). The oyster is in the drink, which is garnished with the Bloody Mary’s classic celery stick (at Seviche | Louisville). 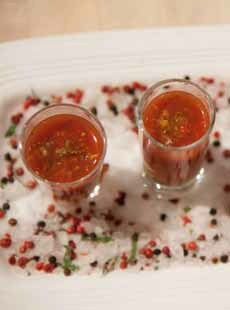 Decorate a serving plate for passing the shooters, with coarse salt, black, green and pink peppercorns (photo courtesy James Beard Foundation). 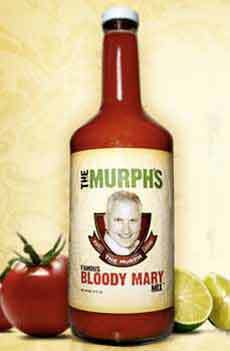 The Murph’s Famous Bloody Mary mix (photo courtesy MurphsFamous.com). January 1st is National Bloody Mary Day. 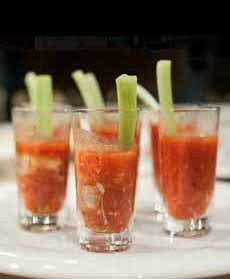 Here’s a great way to start the year: Bloody Mary Oyster Shooters. It’s a charmer of a drink that also helps with that inevitable New Year’s resolution: lose a few pounds. The are fewer than 75 calories per shot, including the oyster. We adapted this recipe from one on Chowhound. Instead, you can use your own Bloody Mary recipe, or a good mix like The Murph’s Famous. Or, simply make a tall Bloody Mary and serve with an oyster or two. 1. COMBINE all ingredients in a shot glass. Stir lightly and top with the oyster. This technique works for 4 to 6 drinks. For a larger number, consider mixing in a pitcher. The Murph (Stephen Murphy) was a stockbroker living on Long Island when he started to think of businesses to start. He hit upon his “famous” Bloody Mary mix, developed years earlier. Putting on the mantle of entrepreneur, he got it into bottles (no easy task) and it’s now sold in 28 states in the eastern U.S.
We are very fussy about our Bloody Mary recipe. We enjoy several of Virgin Marys during the week and like our seasonings just so. While we typically mix our own, The Murph’s Famous has a pleasing combination that only needs for us to add some more Worcestershire sauce (we like a lot of it). In our grandmother’s time, a glass of tomato (pronounced toe-MAH-toe by fashionable people) juice started off almost every dinner. The glass, four to six ounces, was served on a small plate, on top of a paper doily. A silver salver was passed, containing Worcestershire sauce, prepared horseradish and lemon wedges. The big treat, for a child, was the bowl of oyster crackers. Nana was not wealthy, but in those days, even a middle class household could be elegant. If you chance to see menus from top restaurants of yore, you’ll notice tomato juice under the appetizers. It was popular for decades, on the menus of American and Continental restaurants through the 1960s and into the 1970s. Tomato juice was well known and available in cans in the 19th century, but it came into vogue—a fashionable drink—in the 1920s. A chef at the French Lick Resort Hotel in French Lick, Indiana is said to have been the first in the U.S. to include a tomato juice appetizer on a restaurant menu in 1917 (tomato juice does not seem to appear on American menus prior to World War I). The Wrigley Building Restaurant in Chicago came up with clabbered tomato juice which was tomato juice mixed with “a goodly amount” of cottage cheese. Denver’s Blue Parrot Inn blended orange and tomato juices. The Colony in New York mixed clam and tomato juices. Today, that early tomato juice cocktail made with Worcestershire, hot sauce and/or horseradish, lemon or lime juice, and perhaps other seasonings (celery salt, paprika, pepper) is known as…the Virgin Mary.